We visited Sospel in The Alpes Martime today and took the bus from there to Menton. As we travelled down on the bus on the D2566 we saw a number of derelict viaducts. 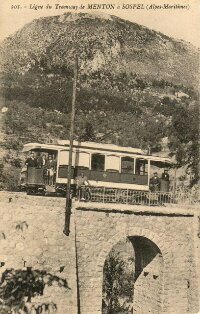 After a little investigation on the Internet we were able to establish that a tramway was opened from Menton to Sospel in 1912/13 which at first was very well patronised with 1st and 2nd Class accommodation. Often freight wagons we attached to trams as they traversed the line. 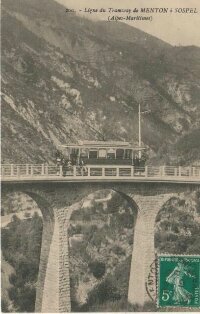 When the main line from Nice to Tende was being built, the tramway provided an easy means for transport of materials from the coast. 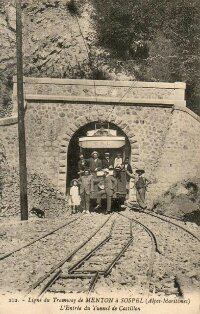 Sadly once the main line was opened usage of the tramway declined and it closed in the 1930s. 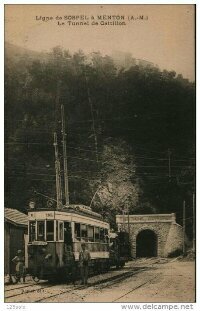 The route of the tramway very closely followed the line of what is now the D2566. 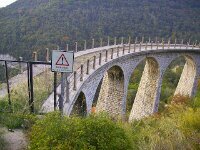 It passed through or close to two villages en-route from Sospel to Menton: Castillon and Monti. This entry was posted in Railways and Tramways Around Nice, Railways Blog on December 10, 2013 by rogerfarnworth. I’d often wondered if the tramway was associated with the Little Maginot forts – at St Agnes, Castillon and Sospel. But as it closed in 1931 not so.